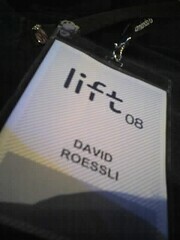 Back to the LIFT conference for the first day of conferences. As last year, I dodn't manage to attend the workshops, or at least not in a serious fashion, but I'm here for the full two days of conferences and events. This time I shall try to live blog this event as the conditions are optimal. My previous attemps all failed due to bad wifi, not enough space, lack expertise in taking notes this way. I usually revert to my notebook after the first talk. Lets try to do better this time.